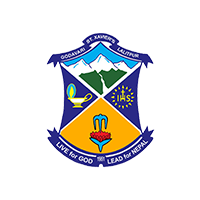 St. Xavier’s School, Godavari is a school under the management of the Nepal Jesuit Society. Nepal Jesuit Society is the Nepal branch of the Society of Jesus, an international Catholic Religious Order. The Society of Jesus was founded in Europe by St. Ignatius of Loyola in 1540. Members of the Society of Jesus popularly known as the Jesuits, have been active in the field of education and other fields of service worldwide since its origin. We, the management and staff of St. Xavier’s School, Godavari are a community of educators. We commit ourselves, along with parents in transforming the society by developing our students physically, emotionally intellectually and spiritually and by instilling in them love of God and country. We strive to form competent, Committed and compassionate students who will be men and women for others living out the values of truth, justice and equality. “Live for God, Lead for Nepal”. St. Xavier’s School Original crest was developed and built by Fr. James J. Dressman, S.J. and Fr. Ed Niesen, S.J. It represents the whole meaning of this Jesuit enterprise. The white X represents St. Francis Xavier who is the patron of our school. The Himalayas representing Nepal: The Himalayas supplying the water for the fertile fields and the country’s greatest resource carries all the symbolism of fertility, both natural and intellectual. The official seal of the Society of Jesus: It represents the worldwide religious organization operating the school. IHSis the monogram for Jesus and is placed inside the Jesuit Sun. Fountain and Lotus representing Godavari: Identified by the ever-flowing fountain of water sprouting up from the fish pond swimming pool in front of Xavier Hall. It springs up out of a lotus with its symbolism of knowledge and purity. Lamp of Knowledge:Producing not just knowledge, but the wisdom to know how to use it. It also means that wisdom and knowledge gained in the schoolmust be used to light up the lives of others. Live for God – This phrase signifies one’s relationship with God and the need to be connected to the Almighty. Our life is a gift from God and we must live in such way that it is pleasing to God. It calls each Xavierian to be spiritual in all that he/she does. Lead for Nepal – This phrase signifies one’s responsibility towards the nation and the call to be a true citizen of our great nation. Each Xavierian is expected to be examples of true citizenship and lead from the front for the welfare and growth of the nation.